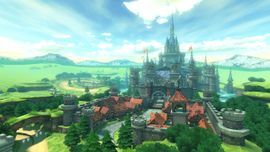 Hyrule Circuit is a racecourse included with The Legend of Zelda × Mario Kart 8 downloadable content in Mario Kart 8 and in the base content of Mario Kart 8 Deluxe, and is the fourth and final course of the Triforce Cup. Hence the name, this course is based on The Legend of Zelda series. This track sports several references to the franchise, such as having Rupees replace coins, Deku Babas replace Piranha Plants, Keese replace Swoops, and several sound effects from classic Zelda games. The interior of Hyrule Castle, featuring the Master Sword. If the player hits all the spin boost bumpers, a Dash Panel ramp will open up near the Sword. The track starts in Hyrule Field, as it zigzags through a grassy area. Several ramps can be found here, before a gliding pad that sends the player into Hyrule Castle. After a U-turn, the player arrives in a grand hall with the Master Sword resting in a Triforce-shaped pedestal. The routes split at the sword, before merging directly afterward. After a jump out the back of the castle, the player lands in a small village before going through a valley with Deku Babas. After a final jump, the player returns to the start. In the field, a mushroom can be used to cut through the zigzags. Before the Master Sword are three crystals that give spin-boosts. If a player touches all three, the "puzzle complete" sound from The Legend of Zelda series will play as a Dash Panel ramp opens up before the Master Sword, allowing the player to jump into it. It acts as an Anti-Gravity Spinner. After exiting the castle, a mushroom can be used across the grass to cut off a turn. The staff ghost for this track is Link on the Master Cycle, Triforce Tires, and Hylian Kite, with a time of 2:11.156. In Mario Kart 8 Deluxe 200cc, Link has a time of 1:40.394. Rupees behave like coins on the track. Coins are replaced with Rupees. Soldiers as portrayed in The Legend of Zelda: Spirit Tracks can be seen near the starting line. Standard track enemies like Swoops and Piranha Plants are replaced by The Legend of Zelda equivalents (Keese and Deku Babas). The Deku Babas change their location several times over the duration of the race. 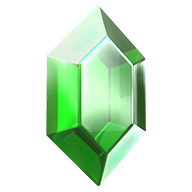 When a player runs into an Item Box and obtains an item, the sound it plays is the jingle when opening a big treasure chest in The Legend of Zelda: Ocarina of Time. Death Mountain, with its familiar circular smoke stack, can be seen towering over the treeline in the south of the course. It can easily be seen just after exiting the Master Sword chamber. Each Medallion found in The Legend of Zelda: Ocarina of Time can be seen on the stained glass windows in the Master Sword chamber. A sign in the village part of the course has the face of Beedle on it, a recurring shopkeeper in The Legend of Zelda series. The sign also has text written in Hylian, as seen in The Legend of Zelda: A Link Between Worlds; when translated it reads, "Item Shop". Hitting the three anti-gravity switches on the castle staircase will cause the Master Sword to rise, allowing a trick to be performed. Also, this triggers the "puzzle solving" tune in The Legend of Zelda series. The background music is a remixed medley of The Legend of Zelda music, starting with the series' main theme, followed by small excerpts of Zelda's Lullaby and Hyrule Field's theme from The Legend of Zelda: Ocarina of Time. It also incorporates a brief segment from Hyrule Field's theme from The Legend of Zelda: Twilight Princess. Rupees replace coins at this track. The only portion of the track that uses the glider. Rosalina approaches the castle's interior. The forest portion of the track. Deku Babas and Keese are encountered there. Link turning the corner before the anti-gravity section. Link turning a corner on the Master Cycle. Link showing off his sword with the castle in the background. This is one of four tracks in the Mario Kart series to have a sound of the roulette item that differs from other tracks of the original game; the others are Waluigi Pinball, Animal Crossing, and Urchin Underpass. This page was last edited on February 18, 2019, at 08:48.